Theodora Slave Empress (1954) is an Italian-French movie about the fascinating wife of Justinian I (reign: 527-565 A.D.): Theodora. Theodora was known as a woman of modest origins, a former slave and dancer. Justinian I was however madly in love with her and one can imagine how beautiful Theodora was. The movie takes place in the era of the Byzantine Empire (476 - 1453 A.D.) also known as the Eastern Roman Empire. Justinian I was the 4th emperor of this empire and he conquered Italy and Rome only to loose it to the Ostrogoths in 546 A.D.. 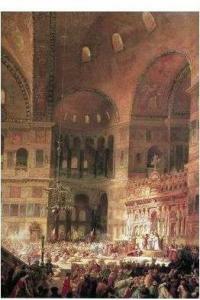 He also built the church of Agia Sofia in Constantinople which can still be admired today. Finally, he banned polytheism. The movie is based on historical sources and legends. It starts with Theodora (played by the very beautiful Italian actress Gianna Maria Canale) catching the eye of Emperor Justinian I (French actor Georges Marchal) as he is walking around the city center's market place. It was love (or lust) at first sight. But Theodora being a former slave draws a lot of hatred from the patrician class. Many schemes are plotted against her including schemes by John of Cappodocia who is Justinian's right-hand man, but she manages to thwart them all. She also does a lot for the plebeian class and for justice for the lower classes. The movie contains nice 6th century decors, splendid views of Byzantium's (known also as Constantinople) including the city's teeming market places, circus, chariot races and amazing palaces. The cast numbers in thousands for some scenes. There are also entertaining combat scenes and plenty of action. On the negatives, the plot and the (dubbed) dialogue could have been better. There aren't many movies about the reign of Justinian I or the Eastern Roman Empire (a.k.a the Byzantine Empire) and that's one reason why we appreciate this movie. Another reason is that it is about the story of Theodora, once a slave and dancer who became Empress, a fascinating story on its own.